(Bloomberg) -- An exchange-traded fund tracking Saudi Arabian shares has delivered the biggest return among peers so far this year as investors anticipate an upgrade of the Middle East’s biggest economy to emerging markets status. 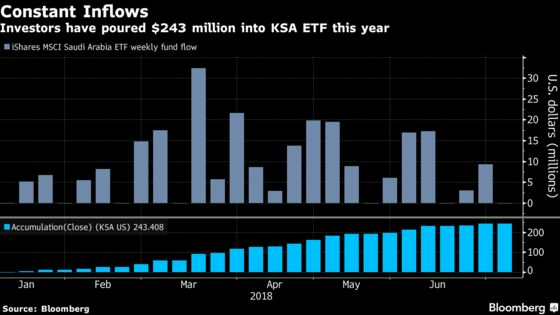 The iShares MSCI Saudi Arabia ETF, or KSA, has returned 17 percent year-to-date, more than any other of the 229 ETFs focused on emerging-market equities tracked by Bloomberg. Its gain compares with an average loss of 6.6 percent for the group in the same period. Qualified foreign investors have been net buyers of Saudi shares in all but three weeks this year on anticipation that the country would earn emerging markets classification from major index compilers this year. FTSE Russell announced the upgrade in March with implementation starting next year, and MSCI Inc. followed suit last month. Total assets of the KSA fund have increased almost 20 times to $271 million since December. The fund has Saudi Basic Industries Co., Al Rajhi Bank and National Commercial Bank as its top holdings. All of these are expected to be added to emerging markets indexes compiled by FTSE and MSCI. Bets on the upgrades have helped the Tadawul All Share Index gain 14 percent gain this year, one of the biggest advances among major benchmarks globally. And as the interest in Saudi stocks grows, other investment firms are launching similar products. Franklin Templeton Investments is seeking approval from U.S. regulators for a Saudi Arabia ETF, while Invesco Ltd. last month listed Europe’s first fund tracking the country’s shares.